The Aska clan lives and dies by a motto, a mantra, a prayer: Vegr yfir fjor. "Honor above life." In time immemorial, the Riki clan's god, Thora, "erupted from the mountain in fire and... flames." As her work burned down the mountain to the fjord where the Aska still live, Sigr, the god of the Aska, rose "up from the sea to protect his people." Since that first fight between fire and water, god and god, the Aska and the Riki have been "bound by [a] blood feud": every five years, the two clans meet in battle, fighting and killing to bring honor to their god and to assure themselves passage into the afterlife. Eelyn and her best friend Mýra are formidable Aska fighters, trained from youth to be merciless killers in the name of their god and their honor. Though it is only their second fighting season, the two teens are so capable that they have earned a place at the front of the fighting line. Adrienne Young's Viking-inspired debut begins as the two fighting mates race eagerly into war, betting on who will kill more Riki. Early in the battle, though, Eelyn and Mýra are separated. Eelyn somehow finds herself weaponless, partner-less and defenseless in front of a Riki warrior. "I looked around us," she thinks, "something churning up inside of me that I rarely felt in a fight--panic." Knowing she is without options, Eelyn accepts her death: "I wasn't going to be brought down by a blade in my back.... I closed my eyes. I breathed. I could see the reflection of the gray sky on the fjord. The willow bloomed on the hillside." Just as the Riki is about to go in for the kill, someone yells his name ("'Fiske! No!' ") and tackles him. Eelyn is confused--the tackler is a Riki. Why would a Riki want to save her life? Then her savior turns in her direction and Eelyn sees his face: "I was frozen. I was the ice on the river. The snow clinging onto the mountainside. 'Iri.' It was the ghost of a word on my breath." Iri, Eelyn's older brother, was her first fighting mate. Five years ago, during her first fighting season, the two lost each other during battle. When Eelyn finally found her brother, it was just in time to watch him fall over the side of a cliff. She ran to the edge and saw "Iri's lifeless body at the bottom of the trench. Lying across the perfect white snow, blood seeping out around him in a melted pool," his organs slipping out of his body. She saw, too, that Iri was not alone in the trench--a Riki had plunged to his death along with Iri and also lay bloody and lifeless in the snow. Like Eelyn's mother, killed in a brutal raid by a clan known as the Herja, Iri was supposed to be in Sólbjo̧rg, the final resting place of the Aska. And yet, Eelyn had seen Iri. When Eelyn tells her father and Mýra what she saw, they believe it to be a spiritual experience and a blessing--Sigr sent Iri's soul to save Eelyn from the Riki. But when the two clans again go to battle, Eelyn sees Iri once more. Determined to understand, she chases him until he and Fiske desperately confront her, begging her to leave them alone. When another Riki happens upon his fellow warriors speaking with an Aska fighter, Fiske and Iri have only two options: take Eelyn as a slave (dýr) or kill her. Iri won't kill his sister; Fiske can't bear to do something that would hurt his soul brother. Fiske knocks Eelyn out and takes her back to their village in the mountains. Iri's new, adopted family--Fiske, his mother and his little brother--take Eelyn on as a dýr, though they are confused as to why Fiske is suddenly interested in keeping a clearly murderous Aska in their home. 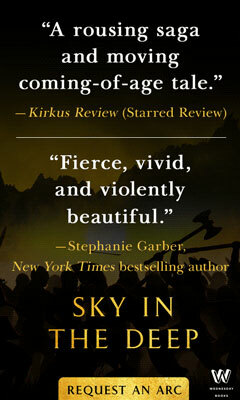 Surrounded by blood enemies and forced into servitude, Eelyn overflows with rage and feelings of betrayal. Her brother allowed her and their father to believe him dead for five years and his treason against Sigr is so vile, there is no way he'll be allowed into Sólbjo̧rg now. Further, being a dýr means Eelyn has lost her own chance to enter Sólbjo̧rg. Her heart is utterly broken knowing that she will never be reunited with her mother, never be honored by Sigr. It seems impossible there will ever be reason for Eelyn to forgive her brother's lie, to see Fiske and his family as anything other than blood enemies. But a more dangerous enemy lurks, growing ever more powerful. Soon, it will be up to Eelyn to save both the Aska and the Riki. Adrienne Young is a born and bred Texan turned California girl. 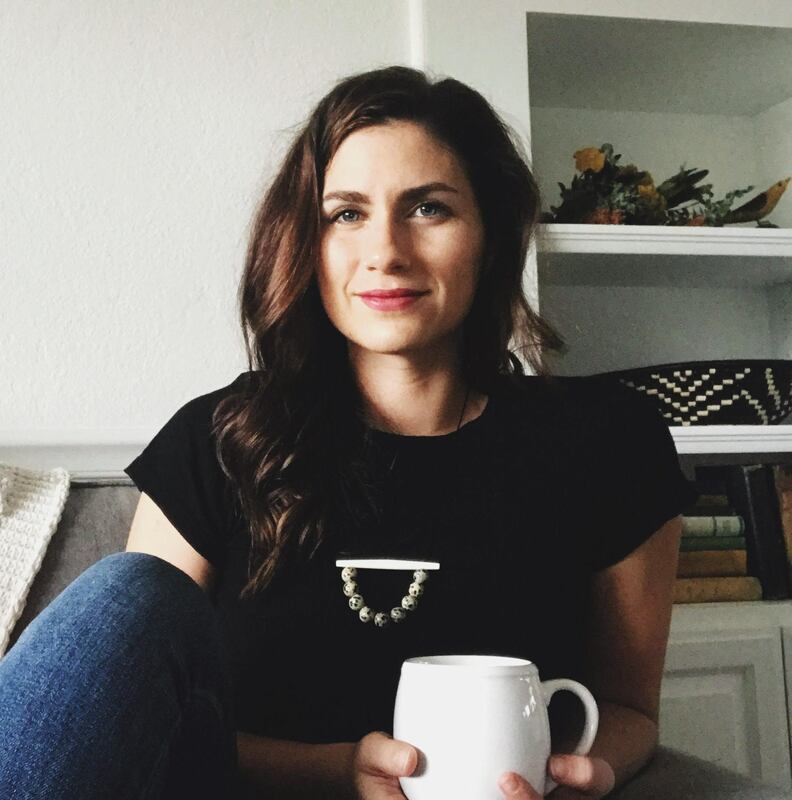 When she’s not writing, you can find her on her yoga mat, scouring antiques fairs for old books, sipping wine over long dinners or disappearing into her favorite art museums. She lives with her documentary filmmaker husband and their four little wildlings beneath the West Coast sun. 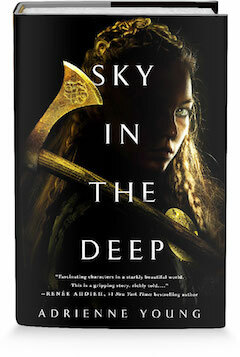 Her debut young adult novel, Sky in the Deep (Wednesday Books), will be available on April 24, 2018. What kind of research did you do to build the fundamentals of this world? I love research so much and this project was particularly fun. There aren't a ton of concrete details that remain from the Viking age, but I did a lot of research on Norse mythology and the gods, and I'm an art history buff, so I did a lot of research in that arena as well. I definitely used what I found as a foundation to build upon and it inspired a lot of the world building. As for the language, it was really tricky because Old Norse is a dead language and there's controversy among scholars about pronunciations and structure. It also blended with and influenced a lot of surrounding languages. The language that's in the book is my best interpretation of what I studied, but I'm not an expert by any means. How much of this novel is historically accurate? The traditions, religions and rituals of the novel are totally made up, as is the five-year fighting season and other social elements. I tried to pull a lot of influence from factual evidence as I built the world, but I wanted it to be its own. Most of what is historically accurate in the book are things like clothing, landscape, buildings, weapons, food, etc. Are the gods of the two clans--Thora (fire) and Sigr (water)--based on a specific mythology? The relationship the Vikings had with their gods is so interesting. The correlation to the elements (fire and water) is definitely something we see in Norse mythology. In my book, each clan is devoted to a different god, but historically, this isn't how Viking belief systems worked. They acknowledged the existence of all gods and their power, but their gods were very human-like in behavior, making the relationship with them unique. They would choose which gods to devote themselves to but recognized the importance of all Norse gods. YA (and our culture in general) doesn't see a lot of female anti-heroes. What was it like to create an "unlikable female" in a culture that so often complains about "unlikable female" characters? Oh, Eelyn, girl of my heart. Eelyn isn't "me," but I wrote so much of myself into this character. My whole life, I've struggled to reconcile who I am with what I was told a woman should be. I was always trying to water myself down, come across softer, not be too aggressive... I hate the term "unlikable female" so much because it plays into the narrative that shaped my view of myself for so long. Writing Eelyn was a cathartic experience, and I was thinking about what kind of female main character I would have loved to read as a teen. We get to see her honesty and passion, and she doesn't shift and change because the world is asking her to. She grows because she's brave. As for her unlikable behavior, I think applying complete and utter desperation to a complex character is some of the most interesting writing you can do. And I absolutely loved doing that with Eelyn. She is willing to do anything for the people she loves. Where did you find the inspiration for Eelyn's story? My first piece of inspiration was that moment on the battlefield when this girl sees her dead brother. 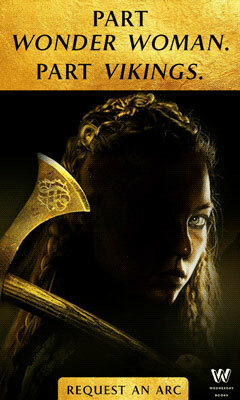 The Viking inspiration really came out of my desire to give Eelyn a setting where being a young female warrior wouldn't be something that had to be explained or justified--I didn't want her strength to be the exception to the rule. And that's really the second part of the inspiration, because I wrote this book right after a time when I had to let go of some things in my life that were keeping me from truly living with an open heart. It was a painful, scary experience to change the way I saw the world but it transformed my life. That is definitely reflected in Eelyn's journey, as she confronts the things she's always been told are true, and then chooses for herself what to believe and who to be. Considering Eelyn is seen as an adult within her culture, why did you decide to write this book for the young adult audience? When Eelyn took shape in my mind, she was young. I think I could have definitely made this an adult novel, but there is something really inspiring and beautiful about the younger generation leading the older into change. I wanted to capture that pure, zealous idealism of the young mind and watch it unravel as Eelyn's eyes are opened. There are some pretty brutal fighting scenes in this book (an eyeball being popped out comes to mind). How did you create these scenes? I really love writing action. I honestly see those scenes play out in my head and I write them down. But I definitely had to research a lot about the human body to make sure I was doing things realistically, like the eyeball. I had to look at diagrams and read descriptions of eyes coming out, etc. And I had to study the kinds of wounds that are created by different weapons to be sure I was portraying them accurately. Do you have more stories from Eelyn's world that you want to tell?